For the municipality in Germany, see Wrist, Germany. A human hand with wrist labeled at left. In human anatomy, the wrist is variously defined as 1) the carpus or carpal bones, the complex of eight bones forming the proximal skeletal segment of the hand; (2) the wrist joint or radiocarpal joint, the joint between the radius and the carpus  and (3) the anatomical region surrounding the carpus including the distal parts of the bones of the forearm and the proximal parts of the metacarpus or five metacarpal bones and the series of joints between these bones, thus referred to as wrist joints. This region also includes the carpal tunnel, the anatomical snuff box, bracelet lines, the flexor retinaculum, and the extensor retinaculum. As a consequence of these various definitions, fractures to the carpal bones are referred to as carpal fractures, while fractures such as distal radius fracture are often considered fractures to the wrist. The parts forming the radiocarpal joint are the lower end of the radius and under surface of the articular disk above; and the scaphoid, lunate, and triquetral bones below. The articular surface of the radius and the under surface of the articular disk form together a transversely elliptical concave surface, the receiving cavity. The superior articular surfaces of the scaphoid, lunate, and triquetrum form a smooth convex surface, the condyle, which is received into the concavity. In the hand proper a total of 13 bones form part of the wrist: eight carpal bones—scaphoid, lunate, triquetral, pisiform, trapezium, trapezoid, capitate, and hamate— and five metacarpal bones—the first, second, third, fourth, and fifth metacarpal bones. It has two articular surfaces named, proximal and distal articular surface. The proximal articular surface is made up of lower end of radius and triangular articular disc of the inferior radio-ulnar joint. On the other hand, the distal articular surface is made up of proximal surfaces of the scaphoid, triquetral and lunate bones. 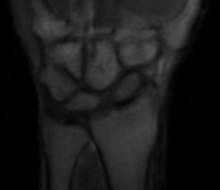 Magnetic resonance imaging (MRI) of radial abduction (rightwards in image) and ulnar adduction (leftwards in image). Marginal movements: radial deviation (abduction, movement towards the thumb) and ulnar deviation (adduction, movement towards the little finger). These movements take place about a dorsopalmar axis (back to front) at the radiocarpal and midcarpal joints passing through the capitate bone. Movements in the plane of the hand: flexion (palmar flexion, tilting towards the palm) and extension (dorsiflexion, tilting towards the back of the hand). These movements take place through a transverse axis passing through the capitate bone. Palmar flexion is the most powerful of these movements because the flexors, especially the finger flexors, are considerably stronger than the extensors. 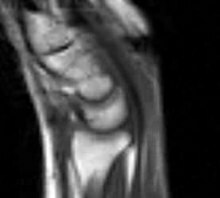 Magnetic resonance imaging (MRI) of wrist extension and return to neutral position. Projectional radiograph of a normal wrist (left image) and one with a dorsal tilt due to wrist osteoarthritis (as well as osteoporosis). The angle of the distal surface of the lunate bone is annotated. A dorsal tilt of 10 to 15 degrees is considered normal. Wrist pain has a number of causes, including carpal tunnel syndrome and osteoarthritis. Tests such as Phalen's test involve palmarflexion at the wrist. The hand may be deviated at the wrist in some conditions, such as rheumatoid arthritis. Ossification of the bones around the wrist is one indicator used in taking a bone age. The term 'wrist fracture' may be used to refer to fractures of the distal radius. Brunelli procedure, related to instability in the wrist, caused by a torn scapholunate ligament. Wristlocks use movement extremes of the wrist for martial applications. Wrist joint. Deep dissection. Posterior view. Wrist joint. Deep dissection.Anterior, palmar, view. ^ Behnke 2006, p. 76. "The wrist contains eight bones, roughly aligned in two rows, known as the carpal bones." ^ a b Moore 2006, p. 485. "The wrist (carpus), the proximal segment of the hand, is a complex of eight carpal bones. The carpus articulates proximally with the forearm at the wrist joint and distally with the five metacarpals. The joints formed by the carpus include the wrist (radiocarpal joint), intercarpal, carpometacarpal and intermetacarpal joints. Augmenting movement at the wrist joint, the rows of carpals glide on each other [...] "
^ Behnke 2006, p. 77. "With the large number of bones composing the wrist (ulna, radius, eight carpas, and five metacarpals), it makes sense that there are many, many joints that make up the structure known as the wrist." ^ Baratz 1999, p. 391. "The wrist joint is composed of not only the radiocarpal and distal radioulnar joints but also the intercarpal articulations." ^ Döring AC, Overbeek CL, Teunis T, Becker SJ, Ring D (2016). "A Slightly Dorsally Tilted Lunate on MRI can be Considered Normal". Arch Bone Jt Surg. 4 (4): 348–352. PMC 5100451. PMID 27847848. Baratz, Mark; Watson, Anthony D.; Imbriglia, Joseph E. (1999). Orthopaedic surgery: the essentials. Thieme. ISBN 0-86577-779-9. Behnke, Robert S. (2006). Kinetic anatomy. Human Kinetics. ISBN 0-7360-5909-1. Isenberg, David Alan; Maddison, Peter; Woo, Patricia (2004). Oxford textbook of rheumatology. Oxford University Press. ISBN 0-19-850948-0. Kingston, Bernard (2000). Understanding joints: a practical guide to their structure and function. Nelson Thornes. ISBN 0-7487-5399-0. Moore, Keith L.; Agur, A. M. R. (2006). Essential clinical anatomy. Lippincott Williams & Wilkins. ISBN 0-7817-6274-X. Platzer, Werner (2004). Color Atlas of Human Anatomy, Vol. 1: Locomotor System (5th ed.). Thieme. ISBN 3-13-533305-1. Saladin, Kenneth S. (2003). Anatomy & Physiology: The Unity of Form and Function (3rd ed.). McGraw-Hill. Wikimedia Commons has media related to Wrists. Look up wrist in Wiktionary, the free dictionary. This page was last edited on 3 February 2019, at 00:54 (UTC).